Redeemer offers a highly respected program with a Bible-based foundation, a community service focus plus music and science abounding. Come in for a visit. If there are financial concerns please don't let that hold you back, we have avenues to help. All Day sessions: Lunch is Bring your Own although Redeemer will provide milk. Currently we are researching a hot lunch program. $50 non-refundable registration fee must be sent in with the registration form. are available to assist with tuition costs. The director has the form for Redeemer Scholarships. Parent Aware Scholarships are also available- up to $7500. The registration form and registration fee reserves your child's place. 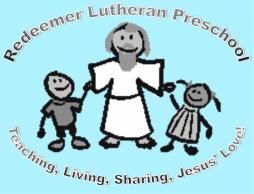 If you have any questions please contact: Rachel Jeppesen, Director, either by calling 320-235-4685, or emailing her at rjeppesen@redeemerwillmar.org. The registration form is the first one to complete and send in. The other forms can be completed by August. We will use our Brightwheel App for emergency information. An invitation to join the Redeemer site will be sent to you before August.